﻿to Be a Hero to a Child in Need! It was another successful turnout for the 3rd annual Denver Heroes Luncheon and 7th annual Broomfield luncheon. More than 850 people gathered to honor this year's Heroes of A Precious Child Award recipients: Ray & Becky Torres, Denver Transit Partners and The Salah Foundation. The luncheons raised more than $246,000, which will allow us to serve more disadvantaged children. We are grateful to the inspirational keynote speakers, Lance Carl, University of Colorado Boulder Associate Athletic Director; and Ramon Alvarez, Regional Vice President Aramark. As well as to Anahi, one of A Precious Child's clients who gave a poignant testimonial. Tremendous thanks to all of our sponsors, with special recognition to presenting sponsor of the Denver luncheon, Kirsty Martinez of Keller Williams Preferred Realty. 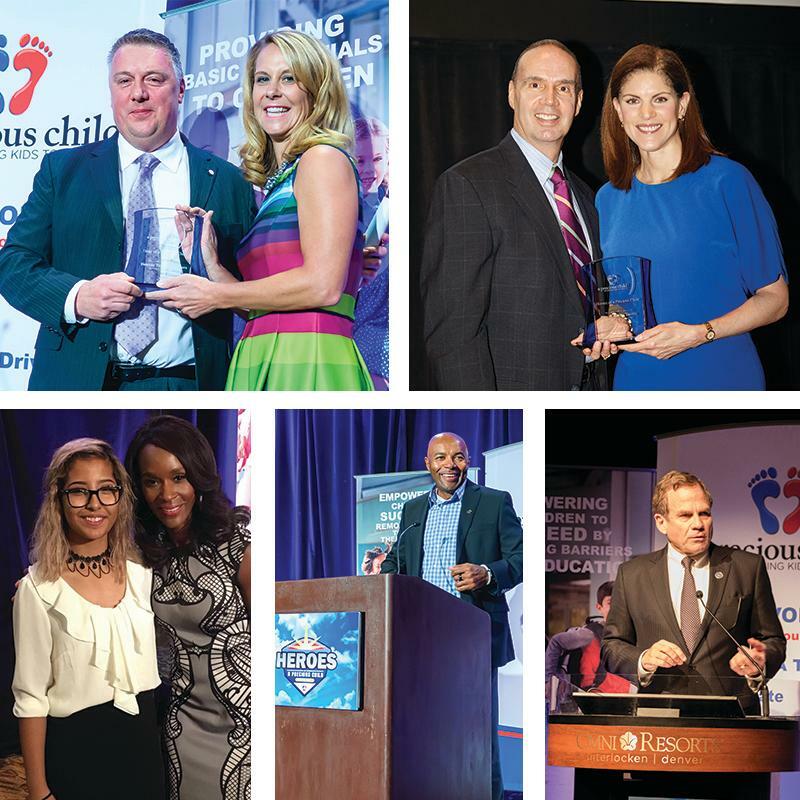 Pictured clockwise from top left: Peter Strange, DTS Project Director at Denver Transit Partners accepting the Heroes Award for Denver Transit Partners and Laura Rinker, A Precious Child's Board of Advisors; Ray & Becky Torres, accepting their Heroes Award; Anahi, client testimonial speaker and TaRhonda Thomas, Denver event Master of Ceremonies; Lance Carl, Denver keynote speaker; and Stan Garnett, Broomfield event Master of Ceremonies. This year A Precious Child's Precious Gift program has received requests to provide more than 8,000 Colorado children in need with gifts this Christmas season, but we cannot help these children without you! For many of these children, these will be the only gifts they receive. Providing a gift to a child in need during the holidays allows them to experience the joys of childhood, give them hope for the future, as well as experience a sense of normalcy during a time in their life that is anything but normal. 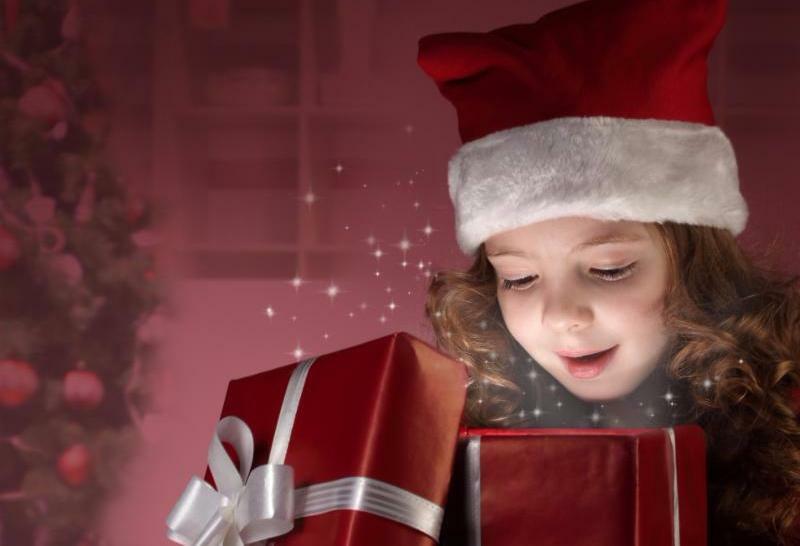 Every $50 donation will help one child in need celebrate the magic of the holidays. Your Donation Goes Further on Colorado Gives Day! 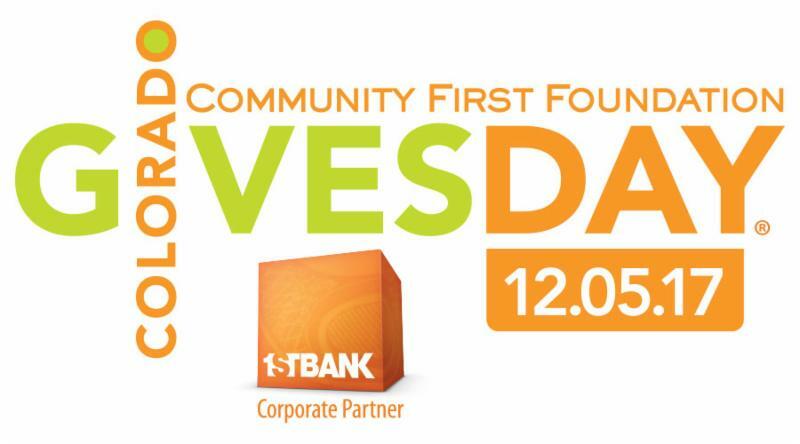 Tuesday, December 5th is Colorado Gives Day, the ultimate 24-hour, feel-good giving experience! What makes this day so special is that it features a $1 Million Incentive Fund, one of the largest incentive funds in the country. Every donation made through the ColoradoGives.org website on December 5th is boosted by the incentive fund, which increases the value of every dollar donated! Please help us reach our goal of $50,000. You don't need to wait until December 5th, you can "schedule" your donation today! 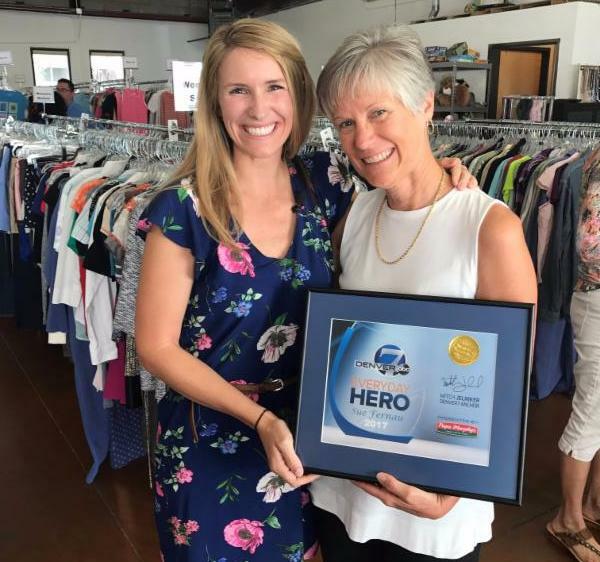 Sue Fernau, a volunteer with A Precious Child since 2013 was recently recognized as a 7Everyday Hero by Denver Channel 7. Sue is instrumental in making sure our 30 satellite boutique locations, housed in schools, health and human service organization and shelters are properly stocked. She is well deserving of this honor and we are grateful for her countless hours of service. Congratulations Sue! Pictured left is Courtney Wickberg, COO of A Precious Child and Sue Fernau, A Precious Child's Boutique Coordinator. Computer Crews exists to provide the best IT Support available through the construction of long term mutually beneficial relationships with small and medium sized businesses. Medtronic's mission is to contribute to human welfare by application of biomedical engineering in the research, design, manufacture, and sale of instruments or appliances that alleviate pain, restore health, and extend life. 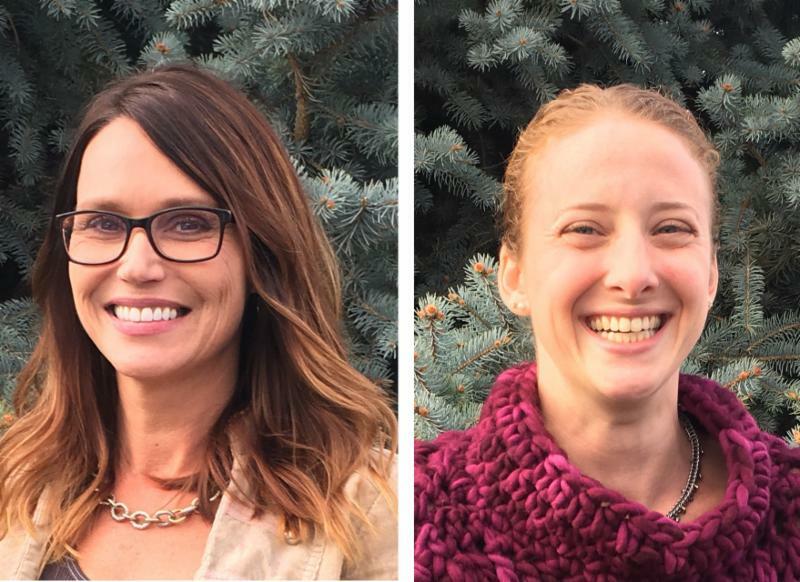 We are happy to announce the appointment of two new members of our team, who will be diligently working in the community to raise awareness and funds so that we can serve more children and families in need. 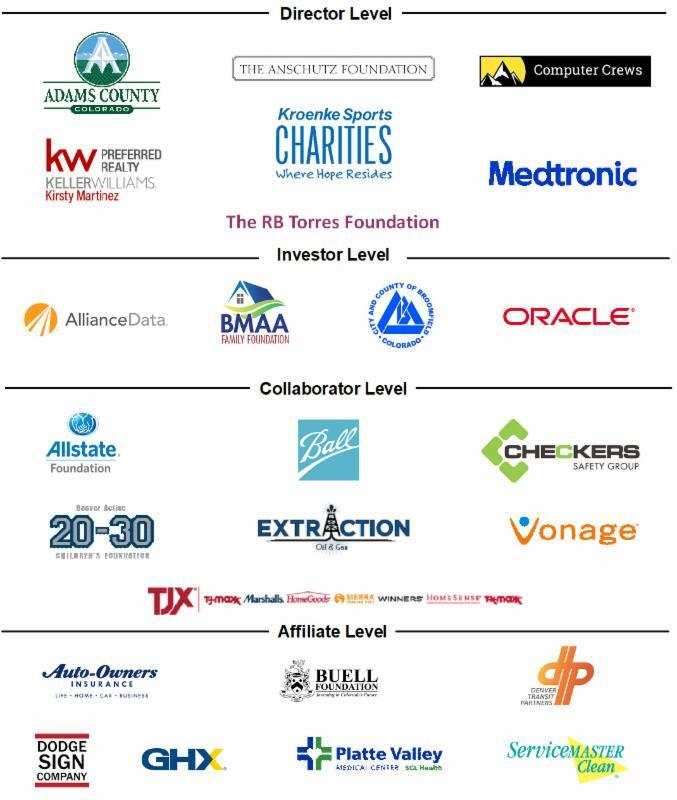 Thank you to our Foundational Supporters!